Cyclical downturns can disproportionately affect end of line carriers since they have few opportunities to pull traffic for long-haul flights, as has been seen with Qantas and to a lesser extent Air New Zealand. 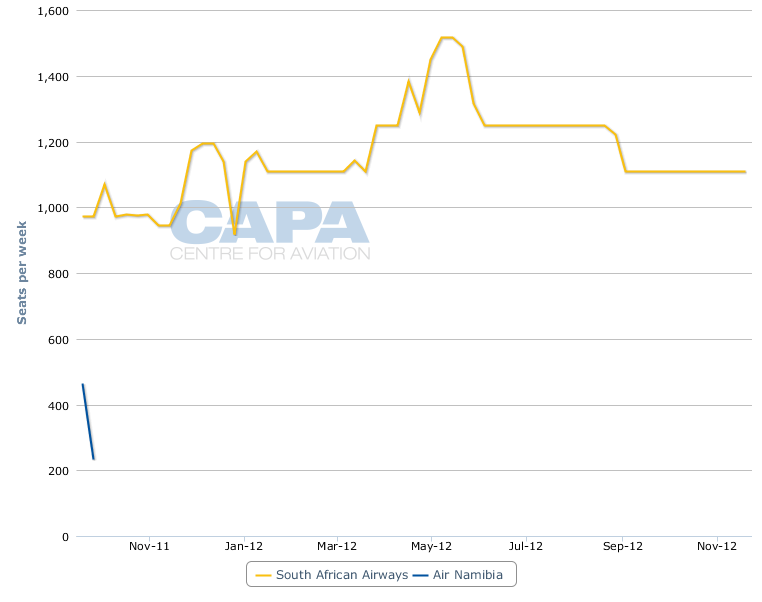 But now South African Airways (SAA) is feeling the pinch and will end from 16-Aug-2012 its London Heathrow-Cape Town service after over two decades of operation. As with Air New Zealand and Qantas redistributing some capacity from competitive intercontinental routes to less competitive and higher-yielding regional markets, SAA intends to expand capacity to the healthy west African markets of Abidjan, Accra and Lagos as well as open longer routes to the healthier markets of Mumbai and Perth. SAA has not previously encountered challenges the way ANZ and Qantas have, a result of South Africa taking a more restrictive approach to air service agreements, SAA being able to fly non-stop to key markets and there is limited sixth freedom competition from other African carriers. But European competition is now taking a greater toll. As much as markets may be enamoured with long-haul intercontinental routes, the simple fact for end of line carriers is that these routes are often highly competitive and airlines like SAA are at a disadvantage for lacking large feed. The result is depressed yields. SAA’s Cape Town-London Heathrow service can have an economy class yield half that of Perth, where it is the sole carrier, or two-thirds of less competitive regional West Africa, where SAA will increase capacity. A low-yielding route like Cape Town-London combined with high taxes (the UK increased its APD and carriers are now subject to the EU ETS), large competition, an economic downturn and dependence on the leisure market makes the route unprofitable, or at the very least unattractive when larger opportunities beckon. The suspension of the daily Cape Town-London route will leave SAA with its double daily Johannesburg-London Heathrow route as its sole direct service to the UK. SAA plans to increase seating capacity on the route by 13%, to partially compensate for the suspension of the Cape Town route. It can achieve this by upgrading services, on A330-200s and A340-300s, to A340-300s or A340-600s. SAA can efficiently connect Cape Town to London via Johannesburg with minimal additional routing, saying in a statement it can “operate more optimally between Cape Town and London via our Johannesburg hub," adding that doing so will have “an immediate positive effect on SAA's bottom line”. SAA also cited the unrealised ambition of using Cape Town as a transit hub for other destinations in Africa, underscoring the significant need for network feed. While the loss of the route has provoked the typical lamenting, Cape Town is a leisure market where direct traffic, especially from end of line carriers, is hard to sustain. A larger factor, however, is the competitive landscape. 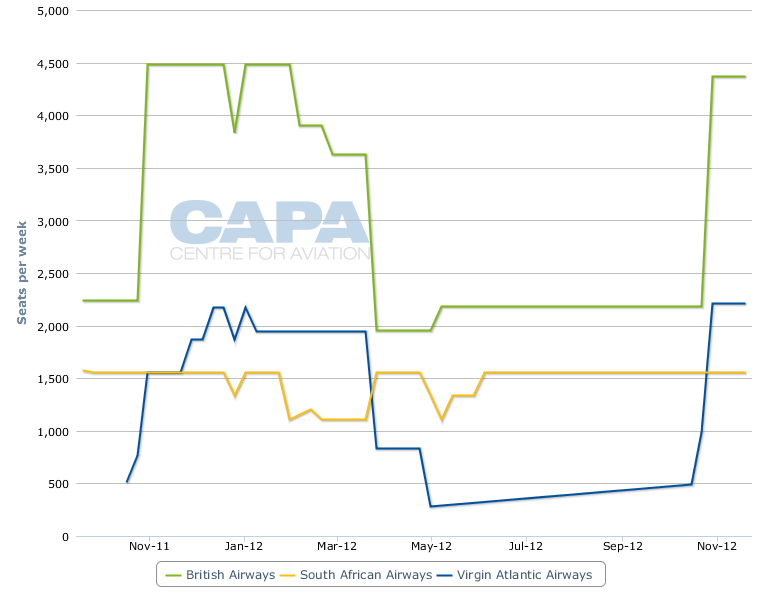 British Airways and Virgin Atlantic serve Cape Town but with significant fluctuations in capacity. Virgin Atlantic has even made the service seasonal and trimmed capacity in shoulder periods. British Airways has its large network while Virgin Atlantic primarily had only local marketing power, which makes service difficult to sustain in the off-season. 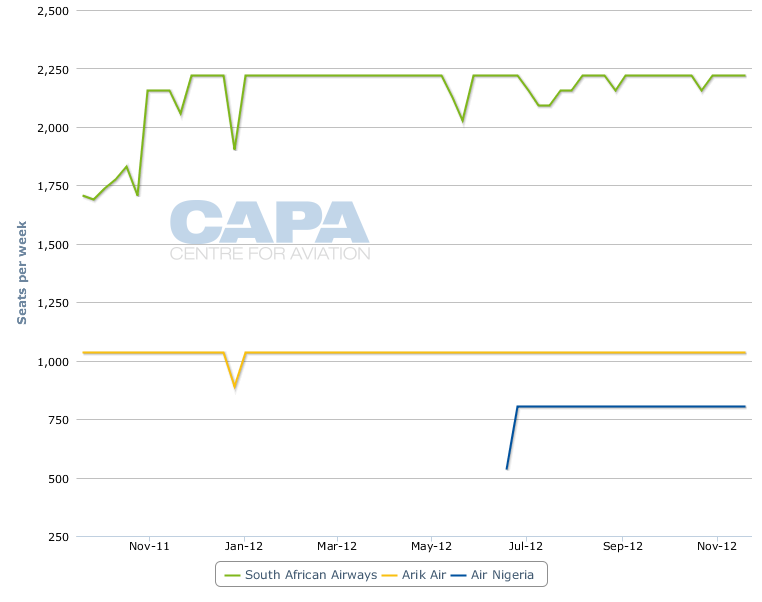 Even with SAA's increased capacity to London from Johannesburg, it will have removed approximately 1100 weekly seats on average, bringing its capacity to approximately 75% of current levels. Whether an airline backfills that remains unclear. There is also notable one-stop competition from European carriers including Air France, KLM and Lufthansa, all with powerful networks to pull traffic from. There is also significant capacity from Emirates with double daily services, but in evidence of the Cape Town market’s low-premium traffic, Emirates deploys its less premium Boeing 777-200ER and A340-300. British Airways’ 747-400 service operates with a low business class density. SAA’s exit from Cape Town-London Heathrow has made available a very valuable Heathrow slot, with an arrival in the prized morning period of 6:20 and a departure at 21:00. Coincidentally, following SAA’s route cancellation Singapore Airlines, having remarked a few week prior it had no additional slots at Heathrow, announced a fourth daily Heathrow service arriving at 6:20. Airport taxes in the UK also influenced the decision. The UK Air Passenger Duty (APD) for long-haul flights of more than 4000 miles increased from GBP75 to GBP81 per passenger in Apr-2012. The distance between Cape Town and London Heathrow is 5994 miles, just keeping it out of the most expensive APD price band, covering flights of 6000 miles or more. The carrier also stated that it was “clear that we would lose money on the direct route in the future”. British Airways and Virgin Atlantic Airways also operate on the route between Cape Town and London Heathrow. British Airways and Virgin Atlantic also compete with SAA on London Heathrow-Cape Town service. The UK is South Africa’s largest travel market outside of the African continent with more than 400,000 tourist arrivals per year. However, travel between the UK and South Africa has been waning. SAA stated traffic between the UK and South Africa has declined by 24% over the past three years, no doubt partially due to the UK’s 2009 requirement for South Africans to pre-apply for a visa, which currently costs ZAR1092 (GBP84). 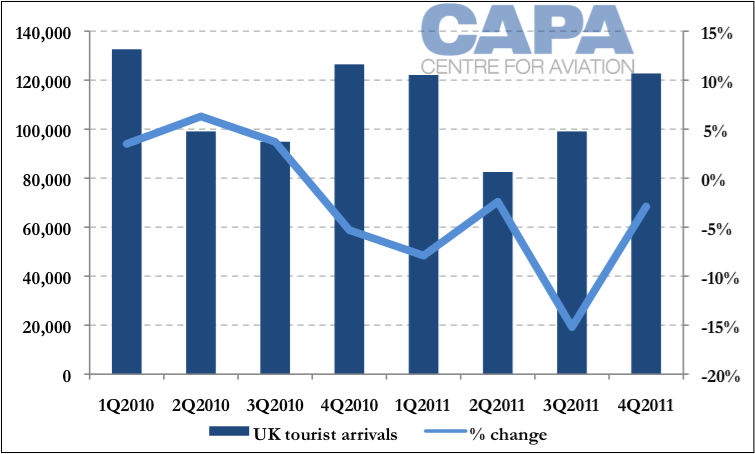 Tourism arrivals from the UK to South Africa have declined in the year-on-year comparison, with the exception of 3Q2011. Also, arrivals have picked up somewhat in early 2012, with January traffic up 2.4% year-on-year and February traffic 5.1% higher. SAA has decided that it could more profitably deploy its aircraft on other sectors, and is looking at expanding its network primarily in West Africa and India. SAA is “redeploying its capacity to routes experiencing expanding demand, as part of our larger strategy for growth and increased efficiency within the airline,” SAA general manager commercial Theunis Potgieter said in a statement. South African’s capacity addition to Mumbai is driven by a significant opportunity afforded from Jet Airways, the only other operator between South Africa and India, ending in Jun-2012 its five weekly flights to Johannesburg, its sole service in South Africa. While SAA previously made plans to boost its weekly capacity by one flight to five services, going from approximately 900 seats to 1100, this was not enough to cover Jet’s 1100 weekly seats. SAA now plans to add an additional weekly service, bringing Johannesburg-Mumbai to six weekly services with approximately 1300 weekly seats, a dip from when the route could see upwards of 2000 seats from Jet and SAA combined. SAA will also bring to six weekly flights its Johannesburg-Accra service with the addition of one frequency. SAA is the sole operator, but West African aviation is growing and Ghana’s neighbour of Nigeria is set to expand links to South Africa with Air Nigeria due to open a Lagos-Johannesburg service, from which it can offer connecting services to/from Accra. The expanded Accra and Mumbai services will be operated from 16-Aug-2012 by the A330-200 coming off the Cape Town-London route (suspended from 16-Aug-2012), but the aircraft still has significant utilisation hours left. SAA intends to launch additional services to Nigeria if the bilateral agreement between the two countries is expanded following a recent review. SAA also intends to open a new route to Abidjan, Côte d'Ivoire, which is seeing its own growth with new carrier Air Côte d’Ivoire. SAA also intends to resume its daily A340-300/A340-600 Johannesburg-Perth service, currently operated six times weekly. 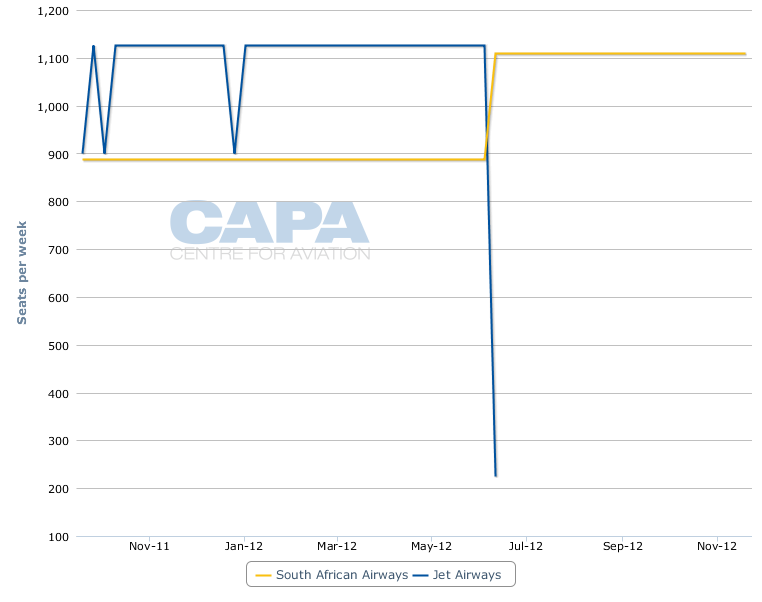 SAA made the route daily in Sep-2009 following bilateral revisions but dropped the route to six weekly services in May-2011 following what SAA claimed were weakening conditions. SAA may be experiencing a resurgence in the market owing to the growing mining and resources boom concentrated around Perth (its official statement about growing Australia-Europe traffic via South Africa seems less plausible). But another factor may be Australia’s willingness disclosed this month to reconsider the SAA-Qantas codeshare it cancelled earlier in the year due to a lack of competition. An additional daily service ­­could show Australia the two carriers are committed to the market and not abusing their position. The end of the Cape Town-London Heathrow is another example of South African Airlines shifting its emphasis away from its traditional – and now overly-competitive – markets towards developing and uncompetitive markets with growth opportunities. This year the carrier has added new routes to Congo and Benin, following on from services to Ndola (Zambia), Kigali (Rwanda) and Bujumbura (Burundi) added over 4Q2011, as well as more frequencies to Accra, Dar Es Salaam, Entebbe, Harare, Mauritius, and Lusaka. CEO Siza Mzimela has shown no problems realising the changed world in which a flagship route like London no longer makes economic sense. She said SAA will focus on a “stronger network of services to the many African, Asian, and Latin American destinations which are of growing importance to South African business and to the tourism industry”.